For other uses, see Wallpaper (disambiguation). Wallpaper is a material used in interior decoration to decorate the interior walls of domestic and public buildings. It is usually sold in rolls and is applied onto a wall using wallpaper paste. Wallpapers can come plain as "lining paper" (so that it can be painted or used to help cover uneven surfaces and minor wall defects thus giving a better surface), textured (such as Anaglypta), with a regular repeating pattern design, or, much less commonly today, with a single non-repeating large design carried over a set of sheets. The smallest rectangle that can be tiled to form the whole pattern is known as the pattern repeat. Wallpaper printing techniques include surface printing, gravure printing, silk screen-printing, rotary printing, and digital printing. Wallpaper is made in long rolls, which are hung vertically on a wall. Patterned wallpapers are designed so that the pattern "repeats", and thus pieces cut from the same roll can be hung next to each other so as to continue the pattern without it being easy to see where the join between two pieces occurs. In the case of large complex patterns of images this is normally achieved by starting the second piece halfway into the length of the repeat, so that if the pattern going down the roll repeats after 24 inches, the next piece sideways is cut from the roll to begin 12 inches down the pattern from the first. The number of times the pattern repeats horizontally across a roll does not matter for this purpose. A single pattern can be issued in several different colorways. Early wallpaper featured scenes similar to those depicted on tapestries, and large sheets of the paper were sometimes hung loosely on the walls, in the style of tapestries, and sometimes pasted as today. Prints were very often pasted to walls, instead of being framed and hung, and the largest sizes of prints, which came in several sheets, were probably mainly intended to be pasted to walls. Some important artists made such pieces - notably Albrecht Dürer, who worked on both large picture prints and also ornament prints - intended for wall-hanging. The largest picture print was The Triumphal Arch commissioned by the Holy Roman Emperor Maximilian I and completed in 1515. This measured a colossal 3.57 by 2.95 metres, made up of 192 sheets, and was printed in a first edition of 700 copies, intended to be hung in palaces and, in particular, town halls, after hand-coloring. High-quality wallpaper made in China became available from the later part of the 17th century; this was entirely handpainted and very expensive. It can still be seen in rooms in palaces and grand houses including Nymphenburg Palace, Łazienki Palace, Chatsworth House, Temple Newsam, Broughton Castle, Lissan House, and Erddig. It was made up to 1.2 metres wide. English, French and German manufacturers imitated it, usually beginning with a printed outline which was coloured in by hand, a technique sometimes also used in later Chinese papers. Towards the end of the 18th century the fashion for scenic wallpaper revived in both America and France, leading to some enormous panoramas, like the 1804 20 strip wide panorama, Sauvages de la Mer du Pacifique (Savages of the Pacific), designed by the artist Jean-Gabriel Charvet for the French manufacturer Joseph Dufour et Cie showing the Voyages of Captain Cook. This famous so-called "papier peint" wallpaper is still in situ in Ham House, Peabody, Massachusetts. It was the largest panoramic wallpaper of its time, and marked the burgeoning of a French industry in panoramic wallpapers. Dufour realized almost immediate success from the sale of these papers and enjoyed a lively trade with America. The Neoclassical style currently in favour worked well in houses of the Federal period with Charvet's elegant designs. Like most 18th-century wallpapers, the panorama was designed to be hung above a dado. Wallpaper manufacturing firms established in England in the 19th century included Jeffrey & Co.; Shand Kydd Ltd.; Lightbown, Aspinall & Co.; John Line & Sons; Potter & Co.; Arthur Sanderson & Sons; Townshend & Parker. 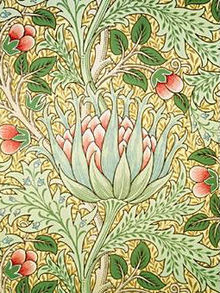 Designers included Owen Jones, William Morris, and Charles Voysey. In particular, many 19th century designs by Morris & Co and other Arts and Crafts designers remain in production. In the early 21st century, wallpaper evolved into a lighting feature, enhancing the mood and the ambience through lights and crystals. Meystyle, a London-based company, invented LED incorporated wallpaper. The development of digital printing allows designers to break the mould and combine new technology and art to bring wallpaper to a new level of popularity. Historical examples of wallpaper are preserved by cultural institutions such as the Deutsches Tapetenmuseum (Kassel) in Germany; the Musée des Arts Décoratifs (Paris) and Musée du Papier Peint (Rixheim) in France; the Victoria & Albert in the UK; the Smithsonian's Cooper-Hewitt, Historic New England, Metropolitan Museum of Art, U.S. National Park Service, and Winterthur in the USA. Original designs by William Morris and other English wallpaper companies are held by Walker Greenbank. Modern wallcoverings are diverse, and what is described as wallpaper may no longer actually be made from paper. Two of the most common factory trimmed sizes of wallpaper are referred to as "American" and "European" rolled goods. American rolled goods are 27 inches (69 cm) by 27 feet (8.2 m) in length. European rolled goods are 52 centimetres (20 in) wide by 10 metres (33 ft) in length, approximately 5.2 square metres (56 sq ft). Most wallpaper borders are sold by length and with a wide range of widths therefore surface area is not applicable, although some may require trimming. The most common wall covering for residential use and generally the most economical is prepasted vinyl coated paper, commonly called "strippable" which can be misleading. Cloth backed vinyl is fairly common and durable. Lighter vinyls are easier to handle and hang. Paper backed vinyls are generally more expensive, significantly more difficult to hang, and can be found in wider untrimmed widths. Foil wallpaper generally has paper backing and can (exceptionally) be up to 36 inches (91 cm) wide, and be very difficult to handle and hang. Textile wallpapers include silks, linens, grass cloths, strings, rattan, and actual impressed leaves. There are acoustical wall carpets to reduce sound. Customized wallcoverings are available at high prices and most often have minimum roll orders. Solid vinyl with a cloth backing is the most common commercial wallcovering and comes from the factory as untrimmed at 54 inches (140 cm) approximately, to be overlapped and double cut by the installer. This same type can be pre-trimmed at the factory to 27 inches (69 cm) approximately. Wallpaper also comes as 'borders', typically hung horizontally at the tops of walls, and above wainscotting. Bordering wallpaper comes in an array of colours and patterns, straight or shaped edges, and widths (sometimes called 'heights' due to its orientation), and is used to provide a finished look to walls already hung with printed wallpaper, or as an accent for painted or plain-papered walls. Some bordering wallpapers are decorated with pictures and even writing, which, when hung, can tell a simple story or a well-known theme, such as fairytales, poems, pictographs of alphabets or numerals, or religious works. In modern western homes, these are referred-to as 'friezes' and commonly adorn nurseries and children's bedrooms. They can also be found in classrooms and libraries. Non-woven wallpaper: Non-woven wallpaper is made from a mixture of chemical pulp and textile fibres, and is used on its own or as a backing for other types of wallpaper. When hanging this wallpaper, the paste is applied directly to the wall, after which the wallpaper will hang on without booking time. Paper wallpaper: Made of recyclable paper. Is also used as backing material for other wallpapers. When using paper as wallpaper the booking time has to be considered. Photo and metal wallpaper: These Wallpapers are applied on a backing material like non-woven or paper wallpaper. When producing photo wallpaper, the picture will be printed on a paper backing. To create a metallic optic wallpaper, the coating of the backing material consist of metal foil like aluminium. Tsang Kin-Wah, one of Hong Kong's best-known painters, creates large-scale wallpaper installations that evoke the floral designs of William Morris in a style that has become known as word-art installation. Like paint, wallpaper requires proper surface preparation before application. Additionally wallpaper is not suitable for all areas. For example, bathroom wallpaper may deteriorate rapidly due to excessive steam. Proper preparation includes the repair of any defects in the drywall or plaster and the removal of loose material or old adhesives. For a better finish with thinner papers and poorer quality walls the wall can be cross-lined (horizontally) with lining paper first. Accurate room measurements (length, width, and height) along with number of window and door openings is essential for ordering wallpaper. Large drops, or repeats, in a pattern can be cut and hung more economically by working from alternating rolls of paper. After pre-pasted wallpaper is moistened, or dry wallpaper is coated with wet paste, the wet surface is folded onto itself and left for a few minutes to activate the glue, which is called "booking wallpaper." This does not work well with non-peelable vinyls, as vinyl is not porous. Nevertheless, it is still effective on many modern papers. ^ "Nicolas-Louis Robert - French inventor". britannica.com. ^ "Paint & Wallpaper: How to decorate your home". www.johnlewis.com. ^ "How to hang fabric backed, non-woven wallpaper". ^ "An overview of the different types of wallpaper". ^ J.P. (May 23, 2013). "Art Basel Hong Kong – Local Pride". The Economist. Retrieved February 7, 2016. ^ Isabella Tam (January 26, 2016). "Tsang Kin-wah And The Organic Necessity Of Art". The Culture Trip. Retrieved February 7, 2016. ^ "How to Hang Wallpaper". thisoldhouse.com. 4 March 2002. James Ward (1851). "Paper-staining and paper-hangings". The world in its workshops. London: William S. Orr and Co.
James Arrowsmith (1856). The paper-hanger's companion. Philadelphia: H. C. Baird. Hints for painters, decorators, and paper-hangers. New York: Industrial Publication Co. 1882. Arthur S. Jennings (1892). Practical Paper Hanging: A Handbook on Decoration in Paper and Other Materials. NY: Comstock. OCLC 21098353. Wall-papers old and new. New York: N. McClelland. 1900. OCLC 14871977. George Whiteley Ward (1900). Wall paper. London: Pitman. Kate Sanborn (1905). Old time wall papers. Greenwich, Conn: The Literary Collector Press. Chisholm, Hugh, ed. (1911). "wall-coverings" . Encyclopædia Britannica (11th ed.). Cambridge University Press. Hunter, George Leland (1918). "Wall Papers". Decorative textiles. Philadelphia: J.B. Lippincott Company. OCLC 339212. Alvah Horton Sabin (1918). "Papering". House Painting, Glazing, Paper Hanging, and Whitewashing. John Wiley & Sons, inc.
Léon Moussinac (1924). Étoffes imprimées et papiers peints. Paris: A. Lévy. OCLC 2897395. Wallpaper in the collection of the Cooper-Hewitt Museum, the Smithsonian Institution's National Museum of Design. New York, NY: Cooper-Hewitt Museum. 1981. Bradbury, Bruce (1984). "A Laymen's Guide to Historic Wallpaper Reproduction (An Overview of Historic and Modern Production Techniques, Some Jargon Unravelled, and Some Tips on Dating Historic Patterns)". Bulletin of the Association for Preservation Technology. 16 (1): 57–58. doi:10.2307/1493915. JSTOR 1493915. Wikimedia Commons has media related to Wallpapers. This page was last edited on 7 April 2019, at 11:54 (UTC).